Leahy, Stephen M. The Life of Milwaukees Most Popular Politician, Clement J. Zablocki: Milwaukee Politics and Congressional Foreign Policy. Lewiston, N.Y.: E. Mellen Press, 2002. 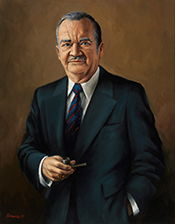 Memorial services held in the House of Representatives and Senate of the United States, together with tributes presented in eulogy of Clement J. Zablocki, late a Representative from Wisconsin, Ninety-eighth Congress, first session. Washington: Government Printing Office, 1984. Ralph Nader Congress Project. Citizens Look at Congress: Clement J. Zablocki, Democratic Representative from Wisconsin. Washington, D. C.: Grossman Publishers, 1972. Zablocki, Clement John. Report of the special study mission to Poland, pursuant to H. Res. 60, a resolution authorizing the Committee on Foreign Affairs to conduct thorough studies and investigations of all matters coming within the jurisdiction of such committee. Washington: Government Printing Office, 1961. ___. Report on Poland, Czechoslovakia, Austria, and Italy by Hon. Clement J. Zablocki, Wisconsin ... pursuant to H. Res. 84, Eighty-ninth Congress, a resolution authorizing the Committee on Foreign Affairs to conduct thorough studies and investigations of all matters coming within the jurisdiction of such Committee, June 1965. Washington: Government Printing Office, 1965. ___. Report on Vietnam, by Clement J. Zablocki, Wisconsin, of the Committee on Foreign Affairs, House of Representatives. Washington: Government Printing Office, 1966. ___. Reports of the special study mission to Latin America on: I. Military assistance training. II. Developmental television. Comprising Clement J. Zablocki, James G. Fulton [and] Paul Findley, of the Subcommittee on National Security Policy and Scientific Developments, Committee on Foreign Affairs. Washington: Government Printing Office, 1970. ___. Special study mission to Poland; report. Washington: Government Printing Office, 1961.